A test of the Orion human space capsule's parachute system in December 2012. NASA plans to conduct another Orion drop test on March 8, 2017. The NASA spacecraft that could one day help ferry humans to Mars is scheduled to undergo a parachute test tomorrow (March 8). The Orion spacecraft can carry humans on long trips into deep space, but once it returns to Earth, it needs a little help touching down. Like the Apollo spacecraft, Orion relies on a parachute system to lower it down through Earth's atmosphere, and safely return astronauts to the ground. The test is scheduled to take place at 7:30 a.m. local time (9:30 a.m. EST/1430 GMT) at the U.S. Army’s Yuma Proving Ground in Arizona. A model of Orion will be dropped from a C-17 aircraft flying at an altitude of 25,000 feet, according to a statement from the agency. NASA is currently investigating the possibility of flying two astronauts on a test flight of the Orion spacecraft as early as 2019. Tomorrow's parachute test will simulate what would happen if an abort sequence took place during Orion’s launch. If something goes wrong with NASA's Space Launch Systems (SLS) rocket that Orion is riding on, NASA officials may decide to abort the flight, meaning the spacecraft would be ejected from its seat atop the rocket. In such an event, the parachutes would deploy and drop the spacecraft safely back to Earth. During an abort sequence, the spacecraft will be traveling at the relatively slow speed of about 130 mph [210 km/h], rather than speeds of about 310 mph [500 km/h] during re-entry after reaching space, according to NASA. The drop will last for about four minutes total; the last one to two minutes will take place under fully deployed parachutes, according to a NASA representative. Orion's parachute system consists of 11 parachutes in total: three forward bay cover parachutes (deployed first), two drogue parachutes (deployed second, at about 25,000 feet), and three pilot parachutes (deployed at about 9,500 feet) that subsequently deploy three main parachutes. The parachute system can slow down the space capsule to just 20 mph [32 km/h] before touchdown, according to NASA. 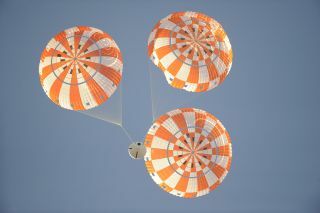 During tomorrow's test, the Orion team will focus on "deployment of Orion's two drogue parachutes at low speeds, and deployment of its three main parachutes in preparation for landing." This will be Orion's second airdrop parachute test in a series of eight qualifying drop tests that will replicate various scenarios in which Orion's parachute system would need to be deployed, according to the statement.